Small adjustments to your pumping system can lead to massive savings in replacement parts, labor, or other resources. Learn how one of GIW Industries Inc.’s oil sands customers experienced significant wear life extension through simple, planned adjustments to suction liners. Slurry pump part wear life is influenced by many factors, including the characteristics of the materials in the slurry. “In the oil sands, the slurry pumps transport very abrasive sand. Operating according to guidelines of effective slurry pumping is key to cost reduction,” says Tony Robins, GIW Fort McMurray Service Centre Manager. GIW gives specific instructions to its customers with regard to extending the wear life of your impeller and liner. In some applications, GIW recommends rotating the slurry pump’s suction liner 180 degrees at about its half-life, at which time wear severity should be assessed. Additionally, GIW recommends using a new gasket or O-ring each time the liner is removed for rotation or replaced with a new liner. Some customers may not realize how crucial these adjustments can be. However, making these adjustments provides a real financial benefit. One of GIW’s oil sands customers was experiencing limitations due to pump wear life. Before calling GIW, the customer’s pumps were limited to approximately 2,500 run hours when suction liners needed replacement. Wear and tear on suction liners is normal, but a high-particle-size distribution, very abrasive slurry materials, high volume and pump heads all contribute to a shortened component wear life. For various reasons, the customer had not been performing regular nose clearance adjustments, not fully comprehending the financial benefit of doing so. The customer reached out to GIW Tech Services for help. GIW helped the customer adopt new methods of operation, including nose gap clearance adjustments. This led to an extension of suction liner life to 4,000 hours. Let’s translate this shift into days. 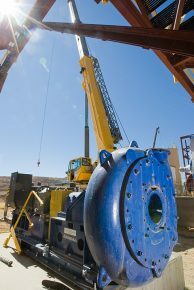 Instead of ceasing operations every 104 days or so to replace worn out suction liners, the customer now needs to perform this critical maintenance only every 166.5 days. This means these parts need to be replaced 2.15 times per year, down from 3.5 times per year. Regular nose gap clearance adjustments help customers estimate actual liner wear rates, increasing accuracy in predicting when suction liners need to be replaced. This reduces surprise suction liner failure and unplanned outages. Since January 2018, the plant’s performance has improved through implementing cost-reduction action plans. Ongoing efforts at the mine to cut costs helped them identify key areas where improvements in performance are essential. “These efforts substantially improved the mine’s output, which led to spare capacity, which in turn allows for time and equipment access to do regular nose gap adjustments,” said Mr. Robins. The Adjustable Suction Liner features pusher and hold-on bolts that allow the suction liner to be adjusted during operation. The pusher bolts move the suction liner forward keeping the clearance between the suction liner face and impeller nose gap very tight. This eliminates the bypass friction of solids that could recirculate in the pump and cause extreme wear. Regular, scheduled maintenance windows where nose clearance adjustments are performed lead to a 40% longer wear life. This helps lengthen parts replacement schedules significantly. Even the initially reluctant staff, who at first balked at the idea of “more work,” now recognize the benefit of this type of regular maintenance, which overall reduces work. The whole team will get on board when understanding is achieved, and when the benefits are fully understood. GIW is committed to our customers’ long-term success, and this is just one step in the process of support and partnership.